With a new year comes new laws as California introduced marijuana campaign ads “Drive High, Get a DUI” when recreational marijuana became legal on Jan. 1. Should this change regulations on campus? The campaign has been out since the beginning of the year, but many people are unaware of its purpose. “The use of marijuana is becoming increasingly prominent among drivers and is creating more safety concerns,” said California Traffic Safety director, Rhonda Craft. “Marijuana is a drug and you should never drive while under the influence. Remember, DUI doesn’t just mean booze,” said the LAPD on a twitter post. Campus law enforcement speaks about driving to campus high or being under the influence while on campus. Campus law enforcement have a guide, provided by Graves and Associates LLC, for marijuana charges on campus. It varies from age to quantity of cannabis. 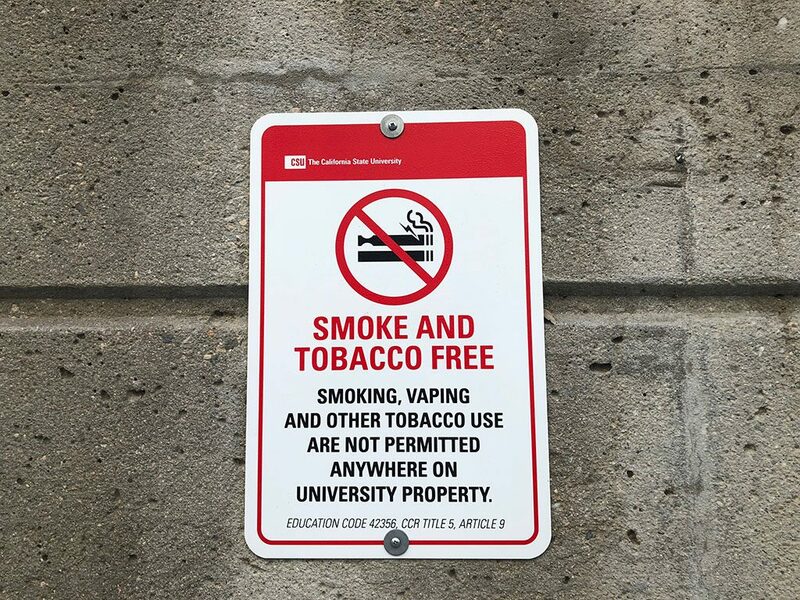 In the past years, students have complained about the smoking areas outside the campus buildings and wondered if any actions would happen. Now that the cannabis law passed, they feared that it would cause more students to smoke on campus. Fortunately for the students against smoking, the new school policies were in their favor. Even though it is a passed law, Chancellor Timothy P. White, called for all Cal State universities to jump on board and create a smoke and tobacco free environment. The new policy prohibits any use of cigarettes, cigars, pipes, electronic smoking devices, tobacco products, chewing tobacco, tobacco accessories, vaporizing liquids and any other tobacco utilization device. Even though signs have been put up in the old smoking areas, many people continue to smoke on campus. Vapes are considered a form of tobacco. Students must be aware that campus officers are giving fines to students walking and vaping or smoking in their cars. Remember, if it is on any school ground, you will get a ticket. Along with the new school policies, tools for quitting were also introduced to the campus for no cost. Cannabis is really gradually being accepted. I would understand why cannabis cannot be legalized inside the campus. Thanks for the information!